Today is supposed to be the thrilling conclusion of Max and The Lost Shakespeare Thank-You Note. And don’t kid yourself, it’s going to be thrilling. Crazy thrilling. Like watching Speed on a roller coaster with Spiderman sitting next to you. But I’m afraid the conclusion will be delayed a day. I’m pulling the baby card on this one. She got a cold, transforming her – as my wife put it – in to a “goo ball.” Then she gave me the cold. ME. Nobody mentioned getting colds from the baby! What the crap!? Hope you all feel better soon. That little bunny is just too precious to ever get you sick, it must have been some other baby. As for Sweet Brown…that’s my girl right there! I wish I didn’t like that video as much as I do – I think 100,000 of those views are me. Looks like soooomeody chose your next adventure for you!! C’MON, K-Bean. I need to know what happens next!!! Oh. Also I hope you feel better soon. Ain’t nobody got time for that shiz..
AWWW! Baby in a bunny hat! You win blogging today. I second that. And third it. And whatever else it takes. Pulling the baby card is one thing. Providing pictures? That’s mad skillz. 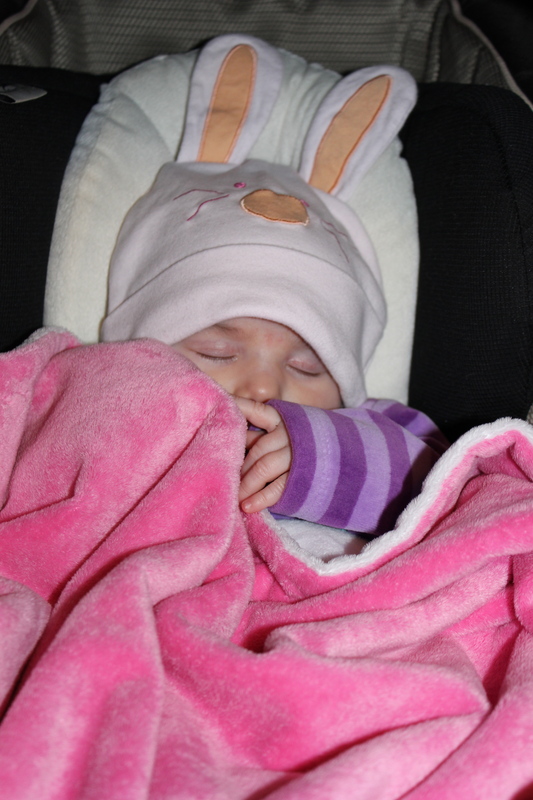 I think a sleeping baby in a bunny hat could defuse pretty much any situation. That song in the video is funny as hell! When I first saw it, I thought it’d be much, much bigger than the “hide you kids, hide your wife” or any of those. Not to be, for some reason. Oh sure, sure. I would know “building the suspense” if I saw it anywhere, and mister, you ain’t fooling me none. Hope everyone is better soon. I guess that baby is cute and all. Just a little. Eh, she’s okay, I guess. Taking care of your baby (the real one, not the blog one) is always a get out of jail free card in my book! It was a moment of clarity when, last night I was approaching writing a blog entry like I had to pay my taxes by the next morning that I thought I’d probably just take the night off. Maybe the Internet wouldn’t collapse. Once again, The Byronic Man makes the right choice and saves the day! I saw that video before – hysterical. What an adorable bunny! Feel better soon. The photo is awesome, she’s too adorable in that hat!! I don’t think you can see her in it and not smile. Maybe even laugh. Who knew something that tiny and CUTE could get you sick? It happens. At least you don’t have to worry about her sneezing in your face now. Hope you all get better soon! I know, shouldn’t she have little baby germs? I’m big and grown up! Aw, man! Feel better, both of you. And….I’m just gonna go head here and copy and paste that adorable photo for use in my post today if that’s all right….I gots nuthin’. I refuse to believe you have a shortage of awesome stories about your daughter. Welcome to the stage where parents and kids can start blaming each other for things gone wrong. It’s awesome! I hear it stops when your child turns 80. Get well! I’m keeping a list of things she owes me. Just so everything’s clear. Personally, I really enjoyed the provided interlude. I will be singing that dang song all day and thinking of the adorable rabbit ear clad baby in pink. I know, it’s unbelievably catchy, isn’t it? Hoping you feel better soon-the cute pic makes up for delaying the finale. I’ll just keeping posting that photo every time I don’t get a post done. Well, that’s an excuse full of mucus. You’re excused. There is just about no video on this planet that will appeal to more than a photo of a sleeping baby in a bunny cap. Gaaaah! The cute is so intense it hurts! Also, I remember my old manager telling me I’d better enjoy PTO while I could still use it for vacation. I thought he was exaggerating, but nope. In the last 3.5 years, rare has been the PTO day I have used for fun instead of recuperation. Hope everyone’s feeling better in no time! Feel better, Byronic Household. And hang on, as the next year or so will be an endless cycle of snot. 🙂 Cheers! Yeah, nice try, B-man. Snotty Bunny Foo-Foo and hipster rip on poor grammar may fool some of the people some of the time, but *I* know writer’s block when I see it blown into a Kleenex!